There’s a lot of chocolate out there, but some of it just ain’t how it used to be. Here are some chocolate bars from the candy graveyard that are greatly missed. Delicious, but their advertising was not on the same scale as Whatchamacallit. 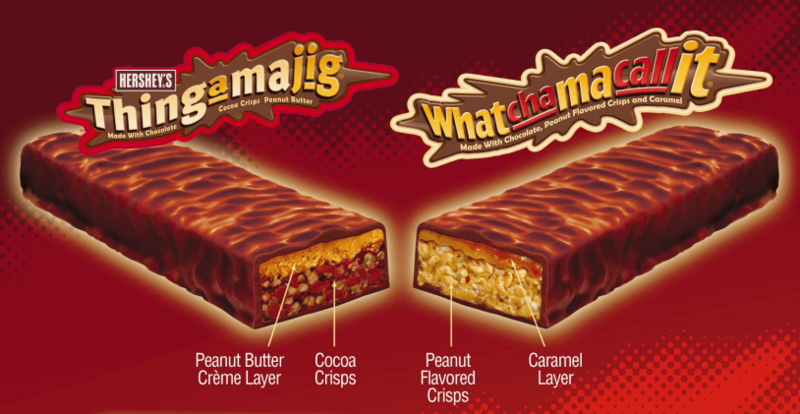 While you may be more familiar with Whatchamacallit, Hershey’s decided to release a similar chocolate bar called Thingamajig in 2009. Thingamajig was comprised of chocolate, cocoa crisps, and peanut butter. Although it was limited edition, Hershey’s brought the bar back in 2011 for a brief time. The Thingamajig’s time with us was fleeting, but still enjoyable. I’m just thankful PB doesn’t stand for “penguin black-belt”! PB Max came on the scene in the late 80s/early 90s, and was more of a giant square of diabetes than it was a bar. PB Max consisted of peanut butter and oats filling, whole grain cookie base, and a milk chocolate coating. Rumor has it that these were discontinued simply because the people over at Mars, who made the candy, just didn’t like peanut butter. The elusive Canadian Choclairs. (Photo Courtesy Candy Critic). This particular chocolate bar came out in the early 90s and was the perfect medley of wafer, chocolate filling, and chocolate coating. Information on this is scarce, though, and I can’t even find a commercial for this thing, unless the chocolate bar turned into a Canadian hip hop artist. Thanks a lot guy, this really messed up my article. Choclairs, the chocolate bar, is also exclusively Canadian, and was produced by Neilson, which is a Canadian dairy company. They also produce Jersey Milk, if that means anything to you (hint: it means they make some amazing chocolate). Cadbury also produces a product called Choclairs, but these are bite-sized candies with various gooey fillings. For this list, Smarties aren’t those weird powdery disc candies you get from the cheap houses on Halloween. Smarties are pretty much Canadian/European M&Ms. 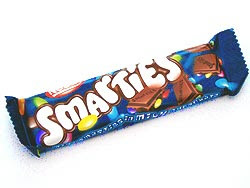 Around 2004, Nestle started selling a Smarties Bar in Canada. This was a solid milk chocolate (or white chocolate, but why waste your time) bar with mini Smarties (like M&M Minis) dispersed throughout. And my god. It was fun to break the bar into squares and eat the little Smarties out of it. Yeah, I have a lot of free time on my hands. A little Internet research shows that there was also a peanut butter variety in Canada. A little more research shows that there was an Orange Smarties in Milk Chocolate variety in Europe. I want that in my mouth! In 1992, Hershey’s introduced a mint chocolate bar, very similar to their Cookies ‘n’ Crème variety. This came a couple years before Hershey’s staple of Cookies ‘n’ Crème, which was released in 1994. A quick search online shows me that Hershey’s Cookies ‘n’ Mint is available at a Wal-Mart about four hours away from me. I’m not sure if it’s expired or just a new reincarnation, but I can’t even express how tempted I am to make that journey. Finally, I can eat a Milkshake (hahhh… dad joke). (Photo courtesy: Candy Wrapper Museum). MilkShake was produced by Hollywood, which was later bought by Hershey’s and then destroyed. It was similar to a Mars Bar (or Milky Way… it was nougat and caramel). It had a nice malt flavor, hence the name. Sadly, there’s nothing like it on the market today, but you can always join Facebook groups and sign online petitions if that makes you feel any better. I guess it didn’t satisfy the beast that well, since it’s not around. Another Hershey creation, Bar None rose and fell between 1987 and 1997. This one consisted of a cocoa wafer, chocolate filling, and peanuts all in a milk chocolate coating. It sort of looked like a thinner Choclair with peanuts on top. Allegedly this is still sold in Mexico, but I think you have other chocolate bars you’d rather get your hands on. Oh god that is good news. Keep adding those cookie pieces! With all the varieties of staple chocolate bars, I’ll never understand why they didn’t bring back the Cookies-n-Cream version of Twix. The caramel was replaced with crème and the cookie layer was chocolate. Cookies-n-Cream Twix was the first Cookies and Cream candy bar on the market (I’ve decided this is true, so it is). This came and went in 1990, and life just hasn’t been the same ever since. 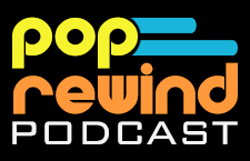 Anyone else getting 90s overload with this one? While the beloved Take 5 chocolate bar is still around, the Canadian equivalent (named Max 5) was discontinued. Overall, this confection was kind of like letting your little brother go into the kitchen unsupervised. Little Billy starts using the stove, melting chocolate, and throwing in everything in sight—pretzels, caramel, peanuts, and peanut butter. That makes five whole ingredients and there you have it. There were a few varieties of this, including one that replaced the pretzels with marshmallows, that made their way into my heart. Or stomach. Or future diabetes diagnosis. Has your favorite chocolate bar been discontinued? Which ones do you fondly remember? Leave us a comment below! I have not seen around a chocolate ..it was called the “coconut bar” its similar to “bounty” but had 3 small bars in package .. its was may favorite for yrs but can not find anymore has it been discontinued? There is a Choclair commercial I found on YouTube; I remember it well, my kids and I though it was hilarious because “it really spoke to me” I love chocolate and I especially loved Choclair, too bad they don’t make them anymore! There used to be one back in the 70’s called “Cinnamon Danish”. I think it was Cadbury that put it out but it could have been Neilson. It was a wafer bar with crispies much like Mr. Big but I seem to recall it was covered in white chocolate with a cinnamon type swirl and flavor to it. It didn’t have a strong cinnamon flavor but it was a childhood favorite and they stopped making it. And for the life of me nobody else seems to remember this except my sister.